So, they tell me there was a weekend in there someplace…. I am really not sure where this weekend went. One minute it was Friday, and the next, I am at work. I spent some time Thursday evening with Deb of Dye Hard Fibre Arts, chatting and pawing through her bin of gorgeous (mostly self-striping) colourways. 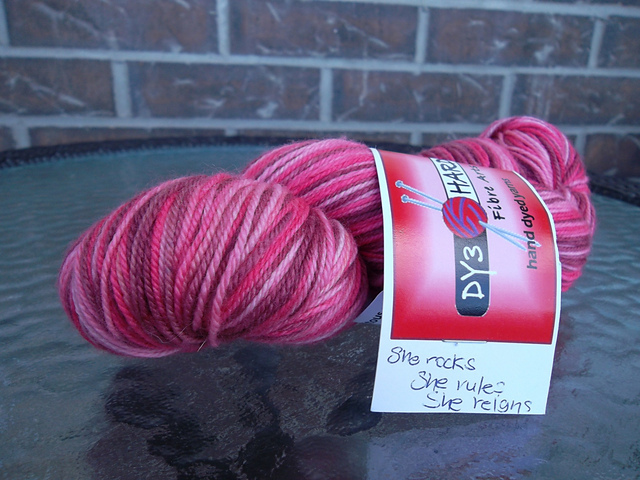 I came away with a lovely pink self striping yarn, named for the Princess Diaries, “She Rocks, She Rules, She Reigns”. 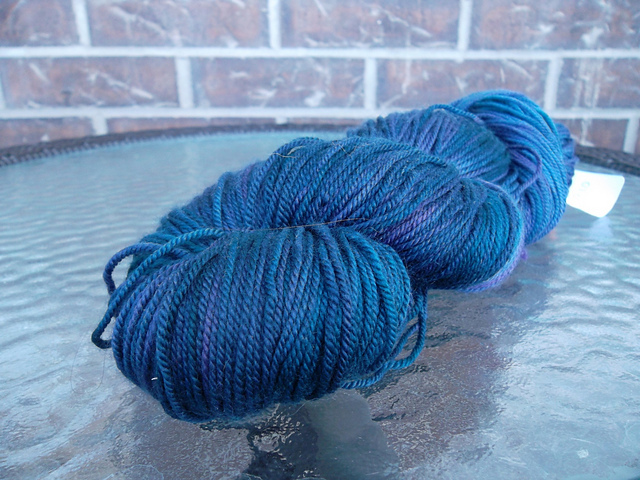 I also picked up a OOAK colourway, that in her dining room looked to be a pretty blue, but only when I got it outside to take a photo of it did I discover how lovely and variegated it was. 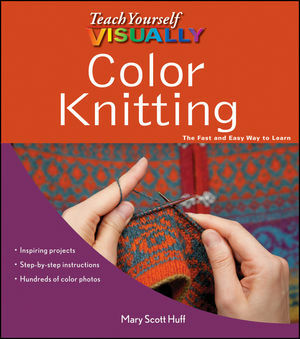 I learned to do colour work from my friend Meghan a few years ago, but have still not actually knit anything. This will be a great reference book to add to my library. Creatively, Saturday was pretty much a wash. I cast on a new test knit cowl for Liz Abinante in a bulky weight yarn, and managed to get a few rows in before bed. My jury is way out on the yarn…it’s a commercial one called Saphira and it looks and feels sorta like Malabrigo Worsted, but is about as splitty as the Phentex yarn my grandmother gave me to knit with when I was 7. Sunday, I cooked. Oh my God…did I cook! And baked some too. I started out by making homemade pancake mix, courtesy of a recipe from Nigella Lawson. Blueberry Buttermilk Pancakes followed, along with a Macaroni Casserole using a recipe that my mom has been using literally for as long as I can remember, and a cooker of Pulled Pork for a potluck at work. You’d have thought that would be enough for one day. You’d be wrong. I have been craving pumpkin cake for about a week, so I located a recipe for a cake with pumpkin, spices and buttermilk (I hate seeing something go bad when only a tiny bit has been used). 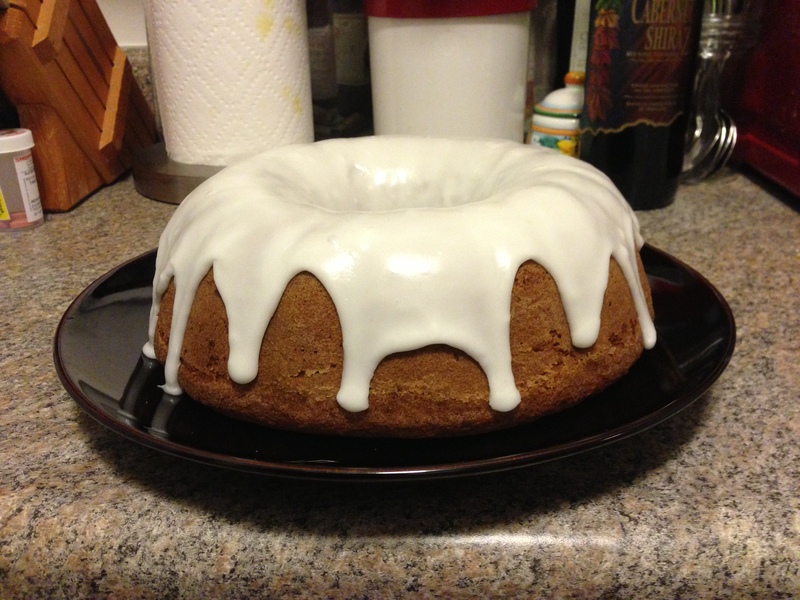 The Pumpkin Spice Bundt Cake with Buttermilk Icing from Epicurious turned out well…although I think it would not be quite sweet enough without the frosting glaze. 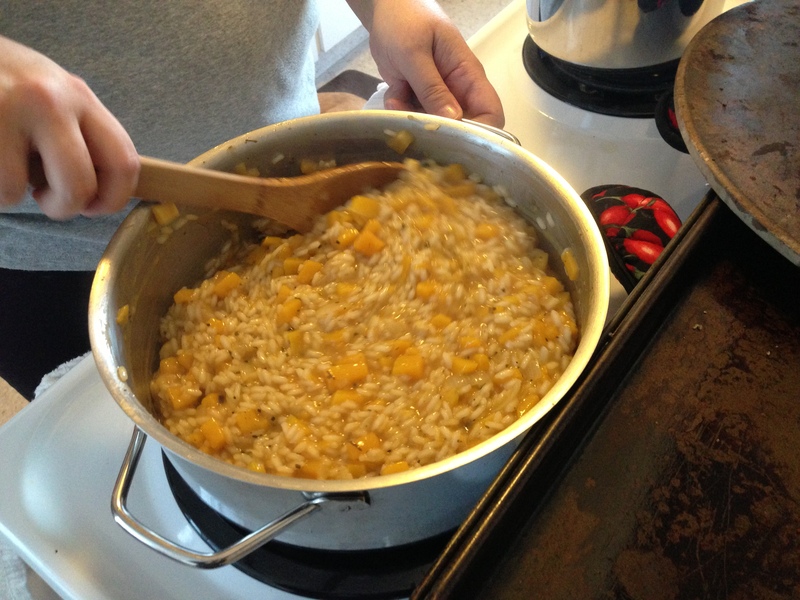 Once that was in the oven, I figured “In for a penny, in for a pound” and proceeded to dice up butternut squash for a risotto I have been making for a couple of years now. I found it in Canadian Living a few autumns back, and fell in love with it, once I realized that for the squash to cook it had to be diced up fairly small. Let’s not discuss the dishes that I did over the day…just too depressing.